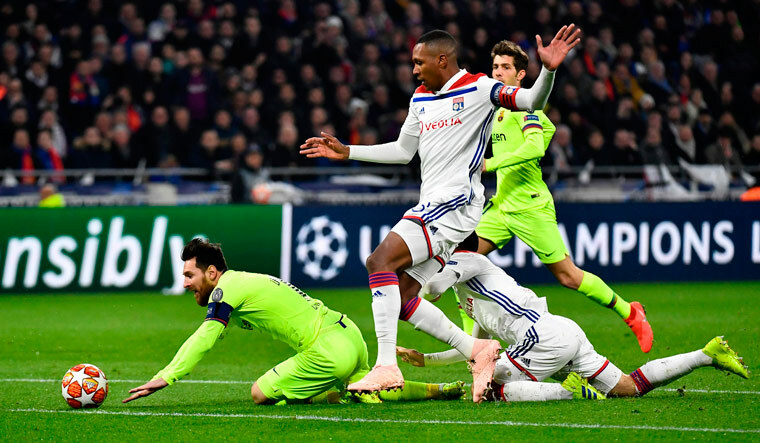 Barcelona will hope to make home advantage count in the return after Lionel Messi and teammates drew a blank in Lyon on Tuesday, the first leg of their Champions League last-16 tie ending in a goalless stalemate. The Spanish side had most of the chances at the Groupama Stadium, with Luis Suarez firing just wide in the second half, but it was Lyon who came the closest when Martin Terrier hit the bar early on. Ernesto Valverde's side once again left frustrated on the road at the business end of the competition, and have now gone six away matches without winning in the Champions League knockout rounds, scoring just a single goal in that time. It is a run that goes back three years. Desperate to end Real Madrid's recent European dominance, Barca must now finish the job when the teams meet again at the Camp Nou on March 13, but Lyon remain very much in the tie. Barcelona's form needs to improve between now and then, though – the Catalans have drawn four of their last five matches in all, and have scored just once, from a penalty, in their last three outings. With Arthur missing due to injury, Valverde opted to play Sergi Roberto in midfield here, leaving the out-of-form Philippe Coutinho on the bench alongside Arturo Vidal. That may have been an acknowledgement that the visitors were wary of Lyon's flying left-back Ferland Mendy, who has been linked with Barca in some quarters. The visitors were certainly right to be wary of a Lyon side whose best performances this season have come against the big boys – four points from a possible six against Manchester City in the group stage and a recent win at home to Paris Saint-Germain in Ligue 1. The French club were without their World Cup-winning captain Nabil Fekir due to suspension though, and it was the 21-year-old Terrier who was surprisingly handed a start in his place. Terrier is an unassuming talent, but he delivered the most exciting moment of the first half for the crowd of almost 58 000 with a thunderous strike from 20 yards out in the ninth minute that was tipped onto the bar by Marc-Andre ter Stegen. The same player later shot well over at the end of a fantastic move from the home side, while Houssem Aouar had earlier been denied by the goalkeeper, but it was Barcelona who enjoyed the longer spells of possession. The Catalans looked more assured on the ball, at least until they reached the Lyon penalty area. Ousmane Dembele – one of two Frenchmen in the away line-up – came closest for them in the first half, but their best chances came after he had been replaced by Coutinho midway through the second period. Suarez came within inches of breaking the deadlock 20 minutes from the end, firing narrowly wide with a first-time shot from Jordi Alba's cutback. At least they extended their unbeaten record against Lyon to seven matches, but there is still hope for the French club ahead of the return.